Xiang Xing Quan is long and Morphology Simulation of various animal, and boxing character image and the image of life. 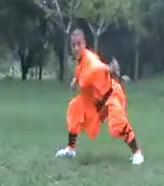 Combined with the characteristics of Wushu boxing action imitation of animal or human. Shaolin Xiang Xing Quan is one of Shaolin Kung fu boxing, unlike other pictographic boxing is boxing, Shaolin Xiang Xing Quan each deep like the secret, attacking and defending, be the most changeful. The best defence is offence. The cute monkey boxing, lithe and come and go freely, to strike first to gain the initiative by momentum, snake boxing to alert and attack its key, tiger boxing and overbearing, leopard boxing violent simultaneously, another Eagle boxing, boxing, mantis, Gou Quan chicken and so on, are vivid, remarkably like the true and calling in the world.